Ridesharing insurance is divided into three periods, with both ridesharing drivers and rideshare companies required to purchase coverage. Period 1 is when the driver has the ridesharing app open and is waiting for a match, Period 2 is when a match accepted but the passenger has not yet been picked up and Period 3 is when the passenger in the vehicle and until the passenger exits the vehicle. The new product provides liability coverage in Period 1, which begins when a driver turns on the rideshare application and is waiting for a match. USAA recently has approved a new ridesharing coverage product in California. USAA’s policy also keeps in force during Period 1 optional coverages that the driver can purchase, such as medical payments, comprehensive, collision, rental, tow, and uninsured/underinsured motorist. This new product can be added to a driver’s existing policy, increasing the premium by 7 percent, according to the California Department of Insurance. 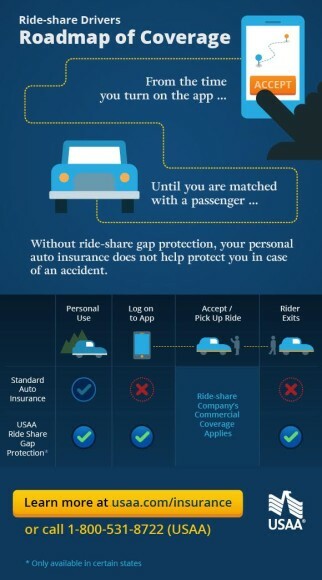 Jones announced earlier this week State Farm is offering ridesharing drivers a new liability insurance option, which like the USAA product covers Period 1. The State Farm product also has the option to add additional coverages. State Farm’s new product is available beginning March 21. The endorsement allows a ridesharing driver to have their personal auto policy fill in the insurance gaps left by rideshare company’s provided coverage. Like the USAA product, State Farm’s policy also keeps in force during Period 1 optional coverages that the driver purchased, such as medical payments, comprehensive, collision, rental reimbursement and towing.